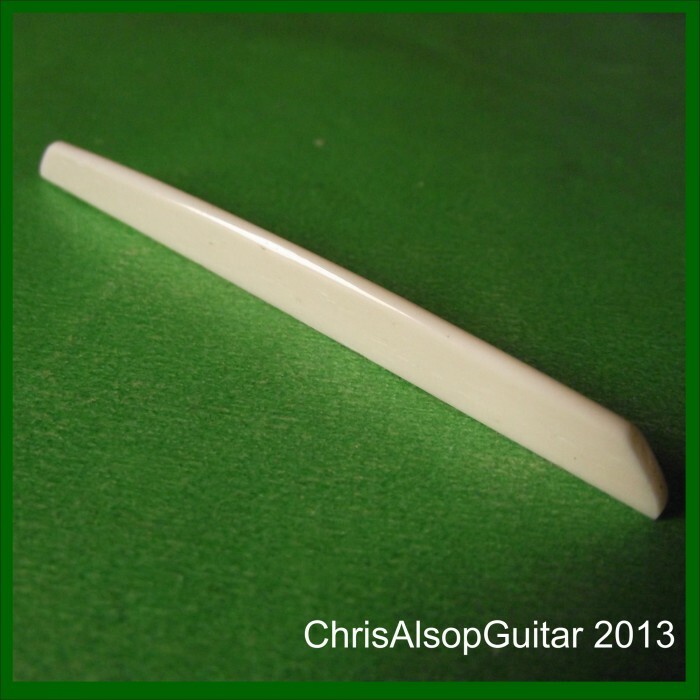 This saddle is hand made from high density Ox bone and is for use on gypsy guitars or acoustic jazz guitars. We make the parts using precision measurement, precision cutters with careful hand finishing and polishing. An accurate, high quality manufacture results. We communicate closely with the buyer to make sure we get the right specification and you receive the full benefit of our knowledge of guitar saddles. • The saddle profile will be a curve from Low E to High e.
• The saddle curvature is 16 radius with height decreasing by 1mm from low E to high e.
• The crown is peaked in the centre. • There is no compensation. If you require any of the default dimensions to be different (eg radius, height decrease from lowE to high e changed, saddle ends shape), please message us. Length: I can provide the length up to 100mm. Width: Saddle slots vary from about 2 mm to about 3.5mm. Height: I can make the height to a maximum of 10mm (and as low as about 3.5mm). 1/TONE TRANSMISSION. 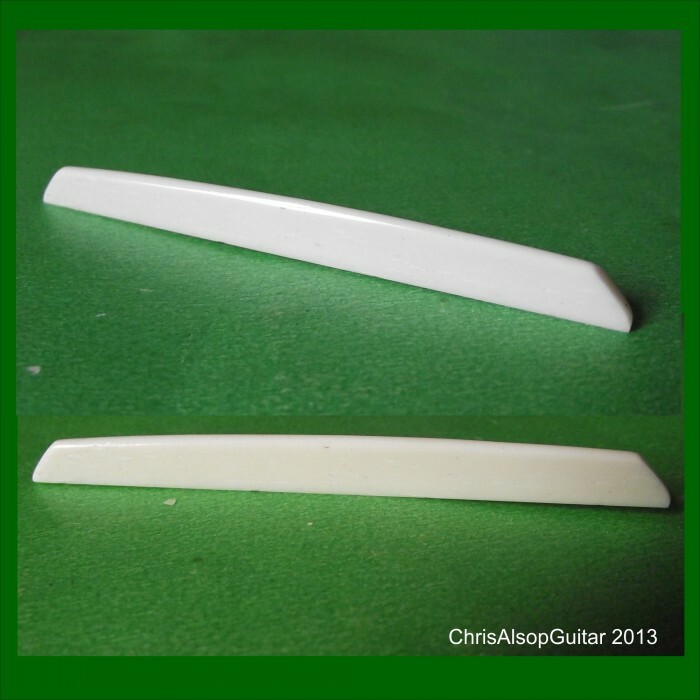 Bone, horn or hardwood saddles sound better than plastic ones because harder materials are more efficient at transmitting the strings vibration energy into the guitars bridge and body. 2/FITTING PRECISION .Often saddles - bone or plastic - are not snug fitting in the saddle slot and some of the strings energy is lost because of this . A goof fitting saddle will always makes an impressive improvement in the tone and loudness. 3/WEAR AND TEAR. 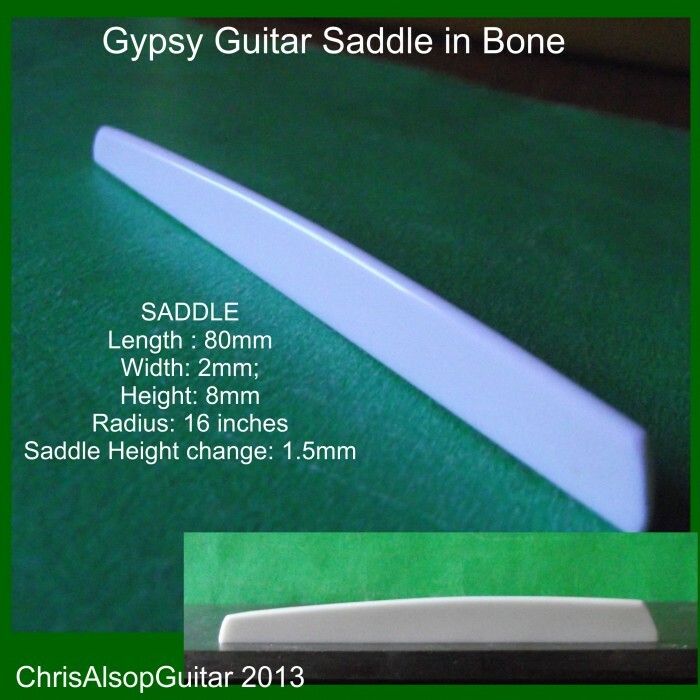 Saddles do wear - often little grooves wear in a well used saddle and these make the transfer of the strings vibration energy into the saddle and bridge less efficient and can cause the string to bind. A new saddle with polished string contact areas - that are the right area as well - massively improve the tone. 4/LOOK AND STYLE. Our saddle look nice, are highly polished and add to your instruments visual style. Everything we make can be in polished natural bone (yellowy),bleached bone (white). Other exotic woods such as TAMBOOTIE are also available which can add a very unique touch to your instrument. 5/BETTER PLAYABILITY FOR LEFT AND RIGHT HAND.Get a better action and playability for the left hand by making the strings follow the fretboard radius. Get the strings in a nice smooth arc shape over the sound hole which helps the right hand. 6/BETTER NOTE PITCH ACCURACY Compensation make the notes more accurate - this makes the harmonies between note simply sound better and this results in everything you play sounding better.